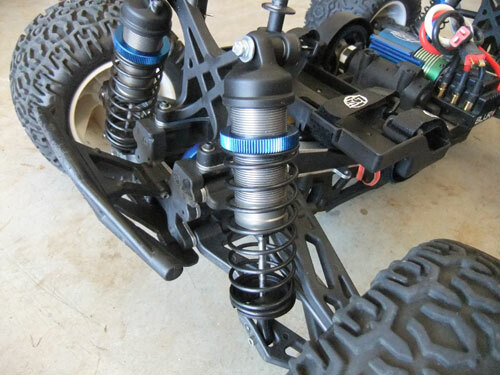 I just installed a new set of threaded aluminum body shocks, and MKS DS1210 Titanium Gear Servo. So far the shocks is smooth as butter and looks great. BUT.... I think I used too thick of an oil, 45wt Losi silicon. I think I might try 40wt or even 35wt next time. I think the 45wt is great for big jumps but its too firm for everything else. The suspension seems too bounce off things, instead of absorbing it. UPDATE: After swtich to 35wt Losi oil it seems to help with the stiff suspension. After trying out the cheap Tower Pro MG995 servos that failed after a few runs, I went with something a little better in quality. Initially I was looking for another Hitec 5955tg because I already have one extra that is not being used. But for the cost of getting one used 5955TG I was about get two MKS DS1210 shipped from Hong Kong. 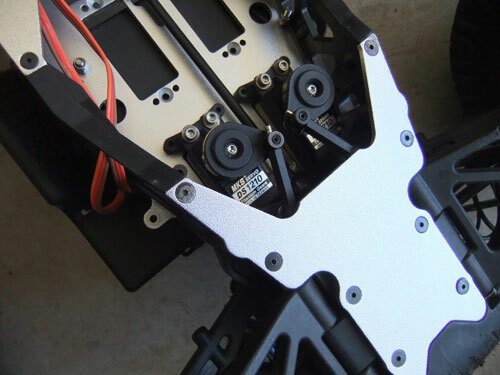 I will be using two of these servos on my LST XXL for steering. That will equal a combine total of over 730 oz of torque! !